Vinyl PVC coated & galvanized welded wire mesh fence is a desirable, extremely cost effective alternative to other fencing types and systems. For a fraction of the money, you can achieve a cost effective and affordable enclosure for a range of applications. The wire can be attached to existing fencing (such as post and rail) or can be installed independently with knock in posts. Great to use in your yard, garden, pool, farm or for deer control. We have it available in various widths, heights and colors including black. 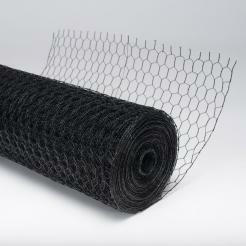 PVC-coated steel rodent barrier that you can easily attach to your deer fencing system for extra protection. Perfect for areas where there is a high population of rabbits, groundhogs, squirrels, and other rodents! PVC-coated steel barrier that you can easily attach to your deer fencing system for extra protection. Perfect for areas where there is a high population of rabbits, groundhogs, squirrels, and other rodents! This hex wire can also be installed on its own for a full metal fencing system. 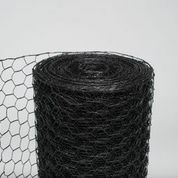 This hex wire fencing is essentially the same as our popular Rodent Barrier/Hex Wire Fence, but is expected to last up to 30 years. Manufactured to be stronger with a break strength of 1250 pounds, this dipped galvanized steel fence has a thicker PVC coating making it rust proof & weater resistant!